Providing quality caravans with the option of allowing you the choice of renting or RENT TO OWN. Needing an extra room or temporary accommodat­ion? Clean and tidy Caravans available, long term hire, caravan in photos is only $80 pw, we have a range of 13-18ft caravans to choose from. Christchur­ch, Ashburton, Methven, Springfiel­d, Darfield, Oxford, Rangiora, Amberley. 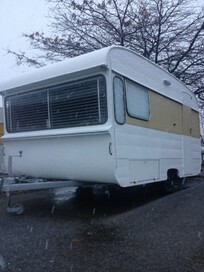 Call/txt Monique 027 932918 for caravan rentals available now. We tow them to your site and set up for free. Warm, clean, tidy and very comfortable caravans. Most caravans have a permanent double bed with comfortable mattresses. All caravans have electrical certificates and are fitted with smoke alarms. We require a bond of three weeks rent plus advance first weeks rent required. With the additional bonus of paying a little extra to own your own caravan at the end of a two or three year period, this gives you more options for your future.